"The film version of Radio Free Albemuth finished production at the end of October. We've been in the editing room since about November 15th and have just about arrived at a "cut" of the movie that I'm happy with from a dramatic point of view. We'll be working on finishing up special effects and music and sound for the next two months or so - then we'll be ready to introduce the movie to both U.S. and international film distributors - hopefully from the showcase point of a great film festival. After the movie is picked up by a distributor, advertising materials like trailers and newspaper ads will be prepared and then the movie will, we anticipate, be theatrically released first in the U.S. then overseas. Later, after the "theatrical window", the movie will be released on DVD. So at this point RFA is probably six months to a year or more away from DVD availability." Absolutely cannot wait. 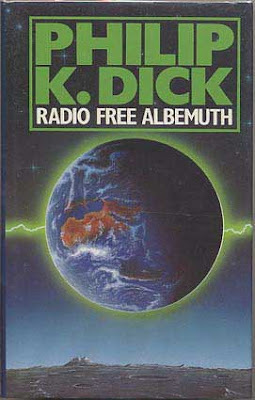 Radio Free Albemuth was an enjoyable read, and is the precursor to Valis (Which I maintain is the finest book I have ever read). The sooner this gets released, the better. if made properly, this movie will end fascism in the USA. w00t ! I played a tourist and a prisoner in this film. The experience will stay with me always. Although it was low budget, John Alan Simon treated the extras very well and Neil Kinsella, well, what can I say, your the best, Thank You. Has there been any progress on the film? Just curious if TDH had any further info about the project. Release Date?? anyone know? I just checked some of the hollywood and movie sites and couldn't get a straight answer. Hmmmm. maybe on the philipkdick.com site? Nope... they show "Adjustment Team" coming in 2010 and not a word about RFA. BTW, it really wasn't a "precursor" to Valis. It was a first draft of Valis that PKD scrapped. It was published posthumously by his estate.